Rain's Garden: Eggplant and Goat Cheese Strombolis and Spinach Sprouts!! Eggplant and Goat Cheese Strombolis and Spinach Sprouts!! Yesterday was an odd day where my mood issues really got to me! We had a beautiful sunny day on Sunday, and that one really nice day of warm weather on Monday. Now it's been two days of rain. But I will say I'm GRATEFUL that it's not snow!!! It's always baffled me that I really have no control over this. I do practice positive thinking, keep busy, make the best of everything, look forward to my garden...but my emotions are still in tune with the weather! Therein lies the comfort food!!! I've figured out that there is no point trying to fight the depression when it wants to come back, so I just roll with it...and eat my way through it lol...:) Yesterday I made some more strombolis. 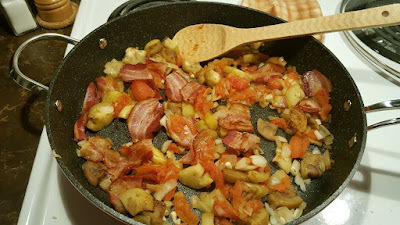 We had some eggplant to use up, so I cooked that with bacon, onions, garlic and tomatoes. We also had extra goat cheese from pizza night, so I mixed that up with an egg white, some Parm and some herbs. I made my thin crust pizza dough and then layered it the usual way with some shredded Mozzarella, the eggplant mixture and then the goat cheese mixture. We finished up the Boston lettuce with dinner so the lettuce is gone, so are the tomatoes. We only ate one of the strombolis, so we'll be having the other for dinner tonight! I just have to figure out what to serve with it...I was hoping to have some lettuce left, but now I must get creative! I have five days to go before my next shopping day and the fridge and freezer are looking quite empty! I'm happy about that though. No waste! 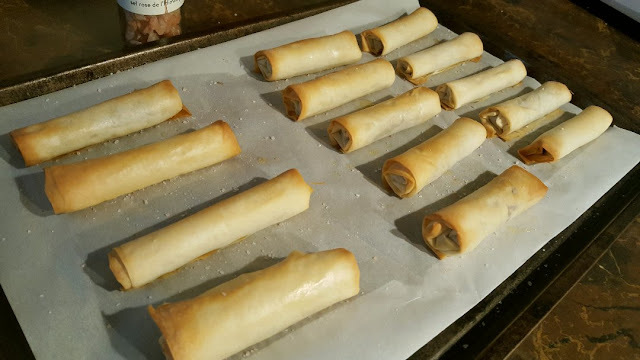 I wanted to use up the last of the frozen Phyllo dough, so I made more of those Nutella cigars. They are so good! I sprinkle them with salt after they're done baking. I got this bottle as a free gift many years ago. Do you use fancy salts? Do you taste the difference? I know I have more of a sweet tooth, but I really don't taste the difference. I know there are many claims of different health benefits with seas salts though. I wanted to post some pictures of my porch from last year. We were so broke after adding four rescue pets to our family of now six fur kids! All of the medical checkups, adjusting, food, accessories, toys and flea meds...turned us from just doing okay to downright paycheck to paycheck again. No complaints, we love the pets! But this brought my creative side out. 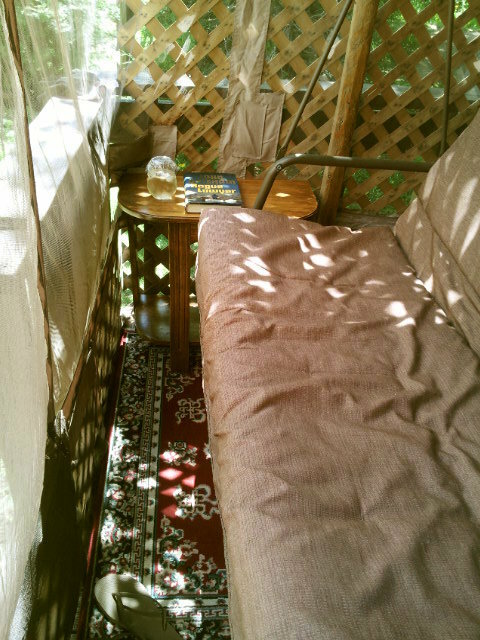 I found an old dining shelter in the old shed and I turned it into a screened-in porch for myself. It got really damaged last summer with the wind and pets trying to barrel through it! So this year I budgeted for wood and screen, and Alex is going to make it permanently screened. We're even thinking of a screen door. You can't sit outside for more than a minute from May through to October without getting swarmed by black flies and mosquitoes in this area. You can see the real size of the porch. The side with the garden tools is barely wide enough to walk in, my "porch life" area is maybe 8 feet long by 3 1/2 feet wide. Trust me, I can fit a lot in that small space! Your pictures make me dream of summer. 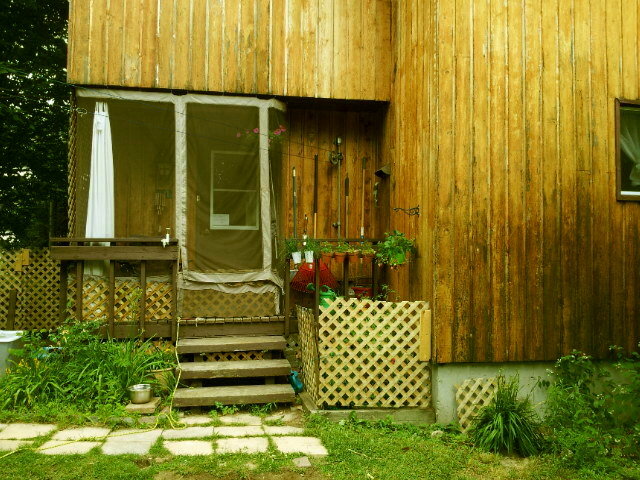 I moved the patio furniture out onto the deck already ... now I cant wait ro add some colour ;) my perennials are all coming up ... I love spring !!! 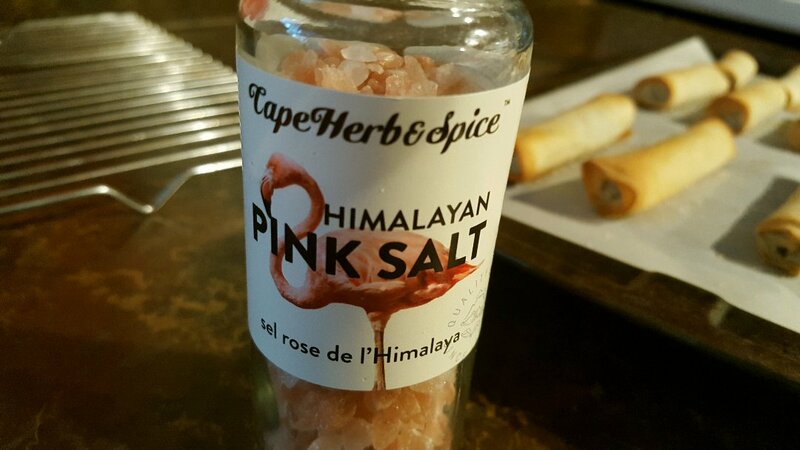 I use fancy salts ... i had a pink salt like u have in the picture. It didnt impress me much. 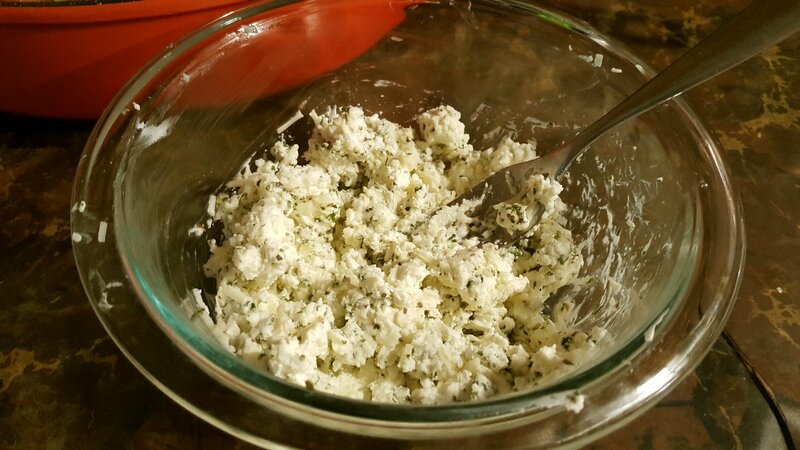 I love to make my own herbal salt mixes. We always use seal salt. I don't usually like cigars, but NUTELLA cigars are a whole different matter! Your house must have smelled so good after cooking the stromboli, good stuff! Hey Nik :)) I HOPE I'll be eating spinach by the time you start planting it. I remember trying my hand at lettuce in 2011, and it just never grew...I still don't know why. But it's looking hopeful with the sprouts! I had to remember to add all of that information to my garden journal. 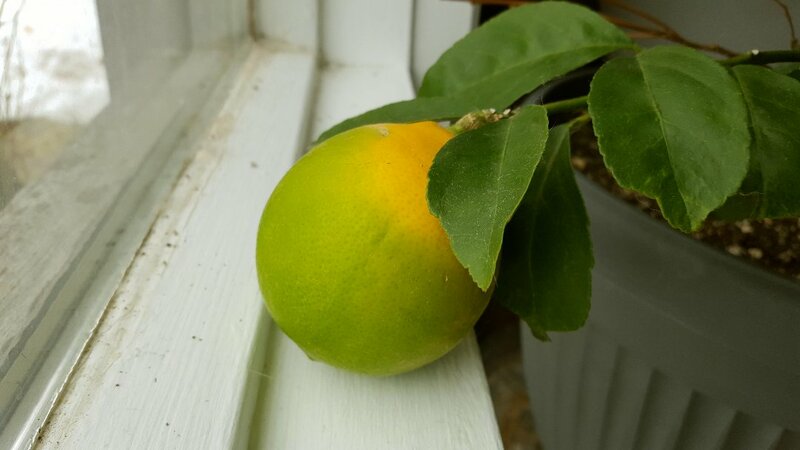 I'm so looking forward to seeing more yellow from the lemon tree...I hope the others don't take a year to ripen too. Lol Debra, I can definitely handle Nutella cigars! :)) But they are almost all gone right now. When you've been talking so much about being outside all the time as soon as the weather turns warm, I've wondered if you were in a unique area that didn't have all the nasty, awful, terrible, bothersome biting insects. Now I know you're just like us and have to try to outsmart them by hook or by crook. Gotta admit when they are bad, I just simply stay inside. I'm like a magnet for them and they drive me nutty. 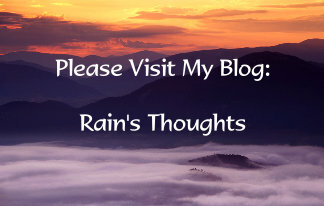 Hi Rain, after a wretched winter my winter blues tend to come with the weather still. I have been good for a couple of days as we have had sun but the cloud is coming. They are also promising snow for easter day. Great. Not. I am hoping they are absolutely wrong with their predictions and the sun will shine. This is funny though because I usually prefer cloudy days, be it rain or snow. But! After winter and its long visit my brain needs the sun for balance. Slowly its getting there! Would that not be totally cool to have spinach by mid May?!!? That would be :) I checked my little seedlings today and I can see little green sprouts starting! Now the trick will be that if they do grow to identify what the ones I am not that familiar with. Good thing I kept the packaging. I think I will be okay....I hope! You know with the mosquitoes being so bad during the warmer weather, you wonder if its not worth having winter year round...of course I am kidding. But man, sometimes when all you can hear at night is them buzzing so loud it sounds like they will come through the screen. We don't get the black flies in the city but we do get horse flies near the lakes. Those take chunks out of you! Or if we are out with the horses the flies are out there. Relentless. I feel so bad for the horses when its the height of fly season. Have a good night - I am late chiming in tonight! I am enjoying lemon-cam. And pulling for the spinach - beets, in my world, work in borscht and little else. I'm the same way. As soon as spring teases, I find that the dull cold days make me feel even worse. I wish I could shake this, but all I need is a little sunshine and I'm happy again, like today! :) I saw snow in the forecast for Sunday too...at least we can be happy that the temperatures will melt it quickly after it falls! Horse flies...ugh...are they the same as deer flies? Those EAT your skin as well, I call them Kamikaze flies because they circle and circle, then come in for the kill. Hate those things, my head net comes in handy during deer fly season that's for sure! But you know, it's such a part of life now that as long as I have a good repellent, and the head net, it doesn't bother me too much. I remember when I first moved to the mountains back in 2000. I had no clue about the black flies and they swarmed me terribly...that's when I discovered netting lol! I love your cozy porch - and your wonderful creative mind! Personally, I feel your priorities are just perfect - I would do (and have done) the same. Isn't it crazy how excited we get when those little seedlings appear? My lettuce and kale have popped up and I find myself checking on them every half hour just to give them pep talks and make myself feel hopeful. Sending you a warm hug from down here. Depression is such a challenge, but you seem to have found as much peace as can be hoped in dealing with it. Hiya!! I am not sure if horse flies are the same as deer flies. Horse flies are LARGE. As in the size of a loonie large. I hate them. When they bite you, you can see the chunk gone. Nasty things. Oh and I found a wood tick on Karma last night. Boo. Too early. Not to mention gross. Thanks so much Susan :)) I have years of practice when it comes to trying to manage depression and anxiety. Depression, I think I have a handle on, anxiety...well, that's all about prevention for me and I can't get lazy or I do regret it! :) I'm TOO excited about the seedlings lol...I know how you feel, I keep checking on them! HI Dianna, Oh gosh...we don't have a tick problem here! I'm happy about that. I've never had to deal with it. Fleas though, ew. The dogs are on flea meds from May 1st through to November. Yeah, those flies do sound nasty! And they seem to get more resilient every year!!! The mosquitoes on Prince Edward Island have developed muscles or something, I remember with that gosh-awful-constant wind...they stuck to you like glue, where a wimpy little Quebec mosquito would blow right off lol.. I can't believe how far I've fallen behind with your posts! Time seems to go so fast the older I get! I love your pictures and how you find unique and budget friendly solutions to things. I'm the same way. I'll see something I like but know I can't afford it so I will try and create it within my budget. Like now, I love the beautiful hand-dyed yarns but I can't afford them so I will be h and dyeing my own! I've never had Nutella but I guess I should try it as everyone raves about it. Congrats on your spinach and beets! You go girl! I'm going to try and see if I can just shop once a month too. Right now it's every 2 weeks. 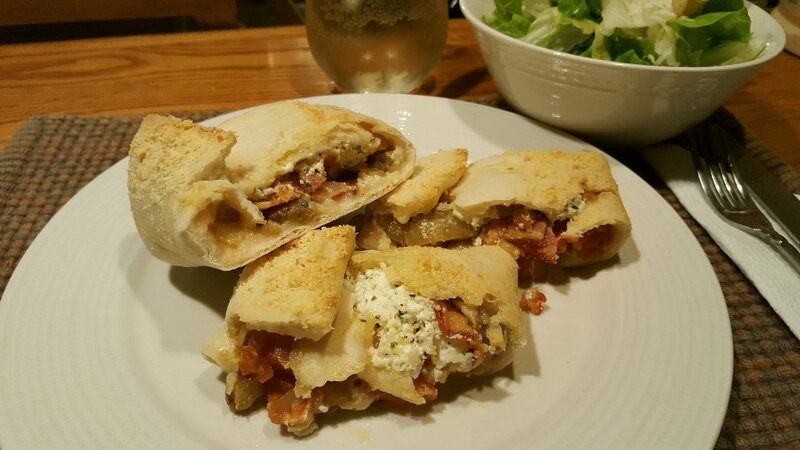 I want to try your stromboli's too! Yum! But it's just me here so I can't keep up with cooking as much as you do...lol! 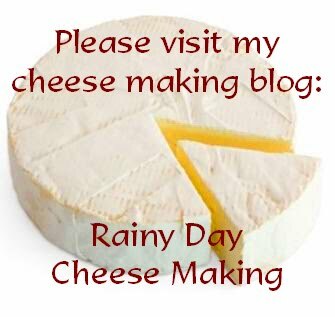 Not sure if you will read this as I am so far behind on your posts but just in case!